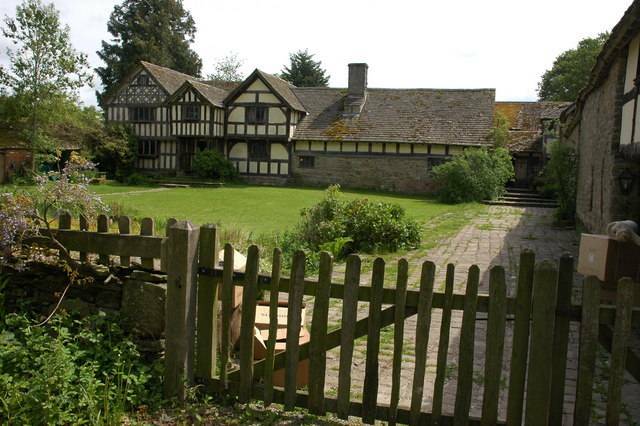 Penrhos Court at Lyonshall is about a mile from Kington and dates from the 15th century. Additions to the original farmhouse were made in the 16th and 17th centuries, and it was much restored in later centuries. There is a glorious banqueting hall with a minstrels gallery and crux beams. Penrhos Court fell into severe disrepair but in 1971 Martin Griffiths and Daphne Lambert bought it and painstakingly restored the buildings, turning the Court into a hotel that became the first in this country to gain the Soil Association Symbol. During his time at the Court, Martin Griffiths co founded the Penrhos Micro Brewery with Terry Jones (of Monty Python fame) which opened on 16th July 1977, and which was fairly successful locally, but certain events forced the brewery to close in 1983. Penrhos Court was sold in 2012, and the new owner spent a great deal of time improving the buildings and surroundings before selling it on again in 2015. It is now, like so many other country houses, a venue for weddings. Going back in time, Penrhos Court was owned in the 19th century by Mr. F.S. Blakely, a farmer with a love of horses, and who bred not only thoroughbreds for the race track but also the glorious Clydesdales. I suspect that once he became successful with his stallions he concentrated on these rather than general farming. Possibly his most famous and celebrated stallion was Lochinvar (or Young Lochinvar) – the son of Languar out of Marciana. He was a beautiful red chestnut, standing at 16 hands with short legs, immense bone and muscular power. He was described as being unequalled and was frequently advertised for stud duties, for the price of five guineas for thoroughbred mares, and two guineas for half bred mares. Grooms fee was 2s 6d. Lochinvar was sold on in 1856 to H.D.T. Grewecke of Portway Cottage near Kington. Mr. Blakely also had another stallion, Bubastes – sire Blacklock, dam by Whisker out of Miss Cranfield. This bay horse stood sixteen and a half hands high, and had a good temperament; his progeny regularly won flat races around the country. The following family appear on both the 1891 and 1901 censuses in Lyonshall, but their address is given as “New House”. Although I can find no sign of a Penrhos Court, I cannot assume that it is one and the same building.